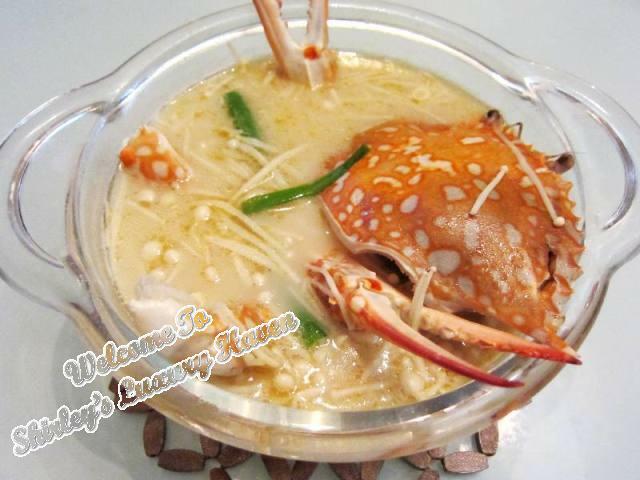 Chinese loves adding Flower Crabs when making Steamboat as the meat is really sweet. Steaming it in a distinct sauce is also one of the most common methods of cooking this crab. Flower Crabs are really economical & relatively easy to cook compared to other species. 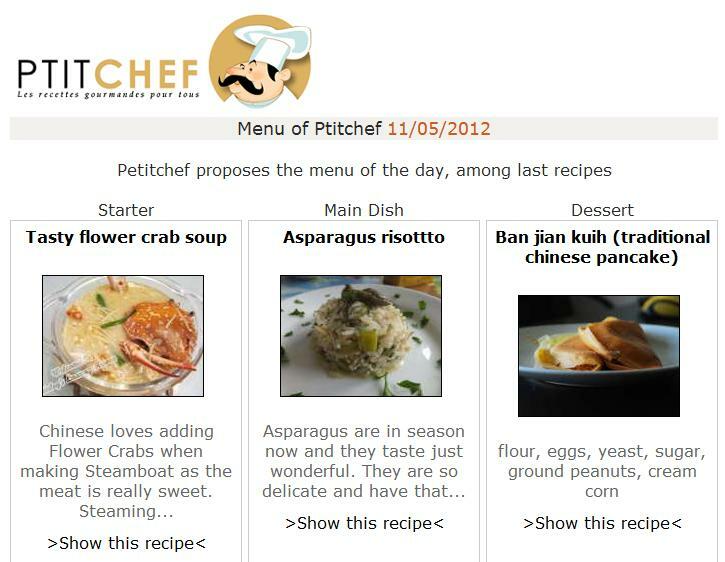 So novice cooks who wanna try their hands on cooking a crab dish can always start off with this recipe. 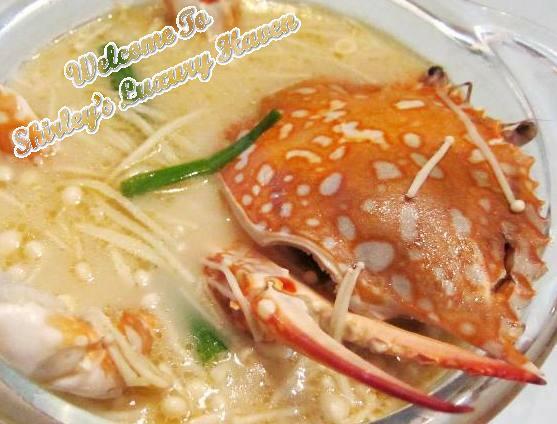 When choosing crab, get one with roes for tastier soup base. Wash crab thoroughly. Remove crab legs by twisting & pulling them off. Loosen shell by lifting it, then turning crab over to remove shell by peeling it apart from body as shown in pix . Dispose gills from body. Rinse crab. Crack the legs using a crab piler. Cut off roots from Enoki & set aside. Heat broth & add crabs. Simmer for about 10 mins. Over-cooking will turn meat tough. Add Enoki, Spring Onion, Milk, seasonings & stir well. Lastly, add wine to your aromatic soup & you’re ready to serve your tasty dish! 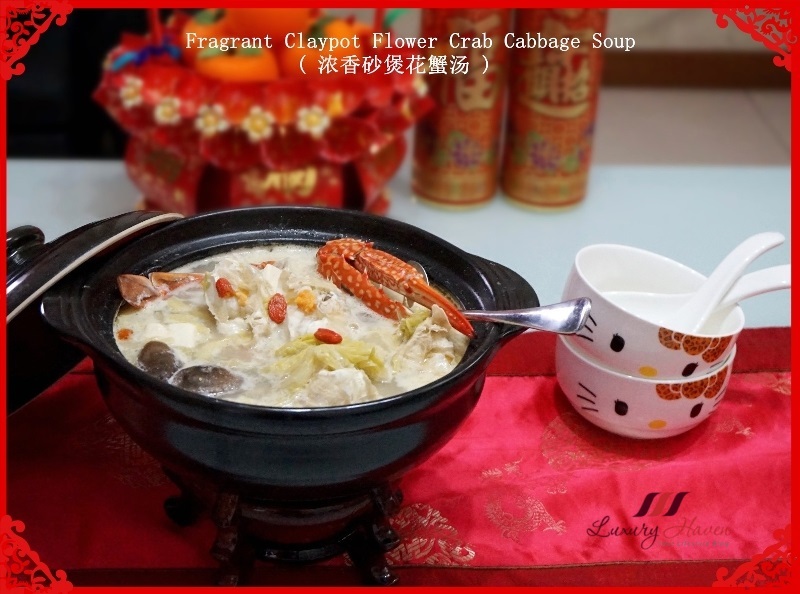 Well, here is another version you may like: Fragrant Claypot Flower Crab Cabbage Soup ( 浓香砂煲花蟹汤 )! Kathy, I'm sure u can get Flower Crabs in the mkt. Makes nice soups! 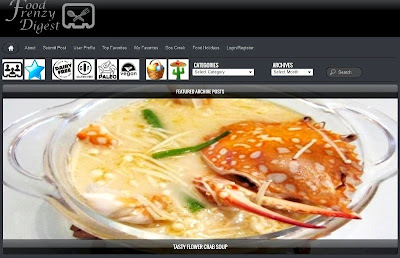 Denise, oh yes... another version of fish head bee hoon soup :) Yummy! Have a good weekend, dear! Stella, thks & enjoy your weekend! Great recipe! Looks very yummy but too bad i'm allergy to flower crab, so i can't eat them. 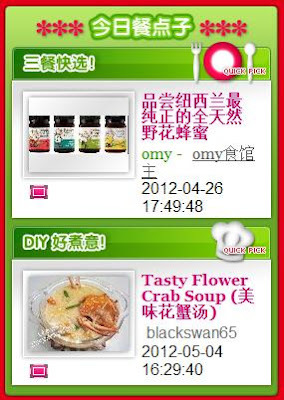 Perhaps replacing flower crab with ordinary mud crab should taste just as nice. wah wah wah, I like crab I like crab!!!! Karen, thks for dropping by! I'm currently away. Will chk out your posts when I return. Hong, u lazy bum! Hahaha! But I'm like that too when I eat out. Lol! missyblurkit, this is one of the simplest form of cooking crab. Flower Crabs are so much easier to handle. Aemy, glad u like it too! Enjoy your weekend, sweetie! oh wow! i have never seen a soup like this! Simply Life, hope u'll get to try it someday. Wonder if Flower Crabs are avail over where u reside. love the 'egg'...haha!! Nice one btw...flower crab porridge also not bad!! !can try it nxt time! Lizzy, hope u found it useful. Thks, dear! The soup looks pretty, but I don't know what a flower crab is? Balvinder, as u can see from the pix above, flower crabs have patterns on their shell & are much cheaper than other types of crabs. U can probably chk with the stall holders in your markets. They make tasty soups. How do you choose a flower crab that has roe in it? ps: I love flower crabs!! FoodieFC, I'm not an expert in that. I'd normally chk with the stall holders. In supermarkets, it's written on the board at times. Have fun cooking! Colors and Grays, it's great having u here & thks for visiting! Will chk out your blog as soon as I get time. Happy to follow each other too. U're cute! Have fun! Wow. It's my first time to see crab soup. Perhaps I should show this to my mum. Hihi you mentioned can replace with fish. Do you mean fish head or fillet? What kind of fish is good? Thanks!!! Doreen, it's wonderful having u here with us! U can use fish head or fillet, but it'll be better coating them with flour & deep-frying first before adding into the soup. Here's another version you can try: Crustacean Lovers, This Is For You! My husband and I love crab meat and I am sure we are gonna love this too although we have never tried crab soup. It sounds flavourful and creamy. easyfoodsmith, u must try crab soup some day if u get the chance. U're gonna love it! What a beautiful looking soup my friend - a seafood lover delight! Choc Chip Uru, thks dear! I'm glad u like it too :) Have a lovely weekend! Congratulations! We wanted to inform you that this post has been selected as a Featured Archive Post on our site for the month of April 2014! FFD, thanks so much for the lovely surprise! Heading over to your site now!